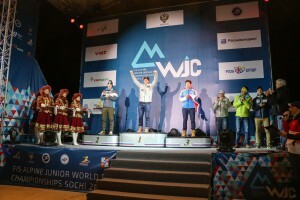 Sochi, Russia – The sign above the door read “Ski Like a Champion.” Erik Arvidsson had taped it there the night before the opening event of the FIS Alpine Junior World Ski Championships in Sochi. A few weeks earlier, Arvidsson and his teammates had visited the Lake Placid locker room that sent the 1980 Team USA hockey team into history. Being in Russia, it was fitting. Ski racing is an individual sport. But the young men wanted a locker room. They wanted to be a team. Race morning, five young ski racers got together in their makeshift locker room. They listened to a recording of the famous Herb Brooks speech that sent the Americans to gold 36 years earlier. 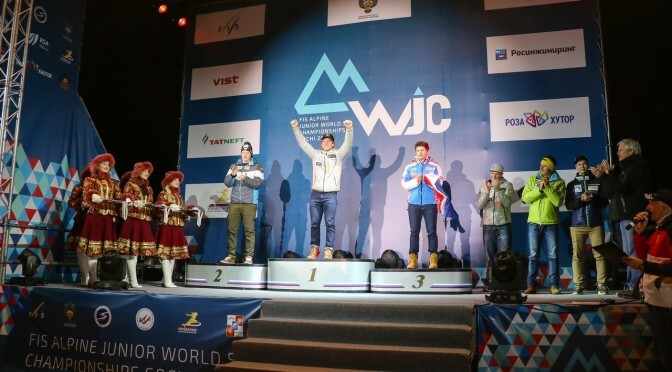 One by one, Erik Arvidsson, Sam Morse, Drew Duffy, Florian Szwebel and Patrick Kenney tapped their ski poles on the Champion sign as they headed out from the athlete village to the slopes of Rosa Khutor. This is the story of the power of a team – the story of American Downhillers. When you stand in a starting gate high in the mountains and place your poles over the timing wand, ski racing is a very individual sport. It’s just you and the mountain – dancing with mother nature, your trust vested into a thin metal edge at 80 mph. In contrast to the loneliness of two minutes speeding down a race course all by yourself, these young men knew the value of friendship and the power of a team that brought them to this place in time. Just 14 months earlier, they lost two of their teammates in a tragic avalanche in Austria. They were tight-knit before, they would grow even closer after. As friends, they grieved together. As a team, they bonded to watch out for each other. They came to Sochi to show the world what they could do as ski racers. There’s a mystical feeling in the mountains of Rosa Khutor. The winds come sweeping through the Caucuses, whipping down from the ridgeline that divides Russia from Georgia, swirling through the cirques above the start. It was a warm day for the downhill – 45 degrees Fahrenheit at their 10:00 a.m. start, delayed for 15 minutes to allow salt to bring the snow crystals together for a firmer course. Arvidsson, just 19, clicked into his Head skis, sliding into the starting gate. Ahead of him was a twisting downhill with a harrowing turn at Russian Trampoline where he knew the race could be won or lost. As he listened to his playlist of rap and house music at the start, he thought about his number one start position, with teammates Morse and Duffy right behind him. Arvidsson grew up in Bear Valley, Calif., home of downhill great Kyle Rasmussen who had won the Lauberhorn in Wengen also wearing bib number one. He pushed out onto the course, his teammates cheering him on. Could this be his day? During the first course inspection a few days earlier, Arvidsson and Duffy stood with coaches Randy Pelkey and Justin Johnson. The young men had already formulated a plan for their racing line. Russian Trampoline was a critical 90-degree turn 25 seconds into the course. In training, Arvidsson skied out, but Duffy nailed it. They knew they had a winner. No one else had picked up on their strategy. As he neared Russian Trampoline he took his line low, setting up a left footed turn to arc himself to the right – keeping as much speed as possible into and through the next right footed turn coming out of a giant compression. The line cut 20 meters off the course and set them up with more speed down the course. It’s lonely crossing the finish line first to take the lead. Arvidsson knew he had a good run and celebrated into the camera. Soon, Morse and Duffy were at his side, Americans 1-2-3 in the early running. When it was over, Arvidsson stood on top – leading a record four Americans into the top 10. Each member of the team brings strengths. Every other member draws off those strengths. There’s an intense respect for their coaches and there’s undying respect back to the athletes. This is a team that is destined to have success.